Rains fell hard on the fourth run in Rocky Mountain House, Alberta, the Battle of the Rockies wrapped up on Sunday afternoon in front of a large and enthusiastic crowd. When the soggy day ended, it was Rick Fraser, driving the Neway Oilfield Services outfit, and along with outriders Chad Fike and Jason Lemieux, that captured the inaugural Battle of the Rockies after posting the best four day aggregate time of 5:18.08. It was a near perfect show for Rick Fraser who took day money on 3 out of 4 nights and established the track record on opening night. 2010 Grande Prairie Stompede champion Rae Croteau ended up in second place overall, 3.01 seconds behind the winner Rick Fraser. Layne MacGillivray finished third overall, with Doug Irvine and Troy Flad filling out the top five for the four day show. As far as the day results are concerned, Rick Fraser posted the fast time of the day with a 1:20.35. Coming off barrel number 1 in heat 5, Fraser, driving the Neway Oilfield Services outfit, placed first on the night by 98 one-hundreds of a second over Tim Haroldson who placed second for the day. Rae Croteau Jr., Layne MacGillivray and Barry Hodgson rounded out the top five for the night. The WPCA Dodge Pro Tour will now move onto Drumheller for the Richard Cosgrave Memorial Badlands Dinosaur Derby starting on Friday, August 27 until Sunday, August 29, 2010. Friday and Saturday races will start at 7:00pm with Sunday’s finals running at 4:00pm. 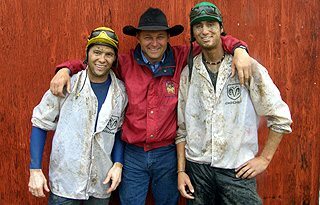 Live coverage of the Richard Cosgrave Memorial Badlands Dinosaur Derby can be heard live Friday and Saturday starting at 6:45pm and 3:45pm on Sunday on Classic Country AM1060 out of Calgary, 890AM CJDC out of Dawson Creek and 99.7 FM The Wolf out of Bonnyville.